Many people who smoke really don’t like their habit. Therefore they seek for help to quit smoking and consider to take some medication which prevents the uncomfortable side effects. Many tablets which help to quit smoking minimize your cravings and boost your chance to overcome your smoking habit. There are several treatments for someone, who wants to stop smoking. You can find options in some pharmacies, shops and you doctor can prescript it. 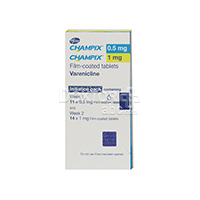 Varenicline (Champix), according to some studies to help people to stop smoking, is the most effective medication. If you want this medication, you should go to your GP or contact an NHS stop smoking service to get the prescription. You should use around one to two tablets per day and the treatment has duration of 12 weeks, but can be longer if it is necessary. It is better to start using from one to two weeks after you quit. This medication is considered safe for most of the people. If you have some a several side effect, you should talk to your GP. Originally, this medication was used to treat depression, but it was discovered that could also help people to stop smoking. The way this medication works is not clear, but it is known that it can affect some parts of the brain, which is responsible for addictive behavior. You should use around one to two tablets per day and the treatment has duration between seven to nine weeks. It is better to start taking the medication from one to two weeks after you quit. Usually, people smoke because are addicted to nicotine. This medication does not have carbon monoxide, tar and other poisonous chemicals included in the normal tobaccos. This medication has a low level of nicotine, which can help to decrease uncomfortable withdrawal effects, for example craving and bad moods, for the lack of nicotine in your body, when you quit. How to stop smoking: website: http://www.cancerresearchuk.org/about-cancer/causes-of-cancer/smoking-and-cancer/how-to-stop-smoking, last check 09. September 2017. Stop smoking treatment : website: http://www.nhs.uk/conditions/smoking-(quitting)/Pages/Treatment.aspx, last check 09. September 2017. Stop smoking: website: http://www.nhs.uk/livewell/smoking/Pages/stopsmokingnewhome.aspx, last check 09. September 2017. How to quit smoking - and stay cigarette free for good: website: http://www.telegraph.co.uk/health-fitness/body/quit-smoking-stay-cigarette-free-good/, last check 09. September 2017.